Our main focus with GameBook is enhancing the golf experience of the typical everyday golfers. But since that happens to include the best and most entertaining (at least in our opinion) live-scoring service on the planet, we didn’t want to leave our ex-colleagues out of the fun. 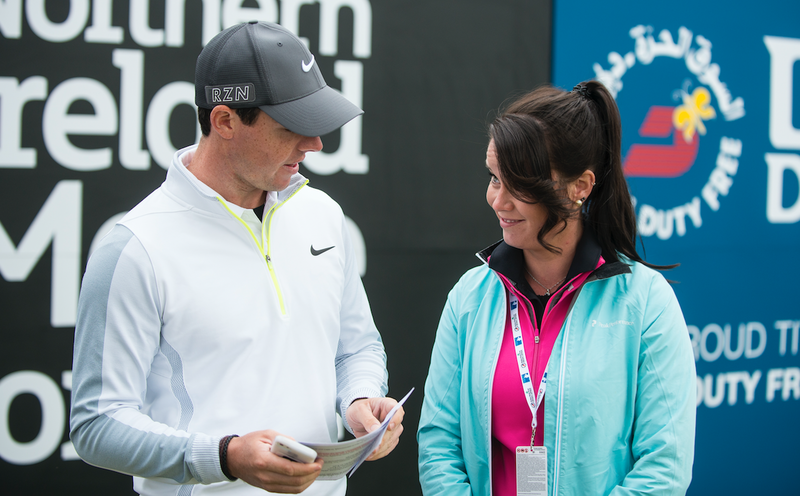 Through the contacts we’ve built throughout the years we have been able to get Golf GameBook into some of the best and biggest charity events and Pro-Ams in the world. This means that our app has been used and approved by some of the best golfers of our time. When organizing live scoring for the Pro-Am events we’ve had some pretty interesting encounters with the pros. The Pro-Am is an important practice round for them and most pros seem to be extremely focused prior to their round. So when we approach them on the first tee with an iPhone for live scoring, many just tell us to give it to their caddie. But once the word has started to travel around about the perks of our fun Game Feed, many of the pros have started to peek over their caddies’ shoulders. And many times it has been hard for me to believe all the positive feedback they have been giving us when returning the phones after the round. To me the most heartwarming of all compliments have been those coming from my own golf idols Jose Maria Olazabal and Colin Montgomery, who said this is the way Pro-Am scoring should be done every single time. It isn’t just fun and easy, but manages to bring a whole new dimension to the day which is just as enjoyable to the amateurs as it is to the pros. Here I am giving a GameBook lesson to Thorbjorn Olesen and his caddie in Abu Dhabi. 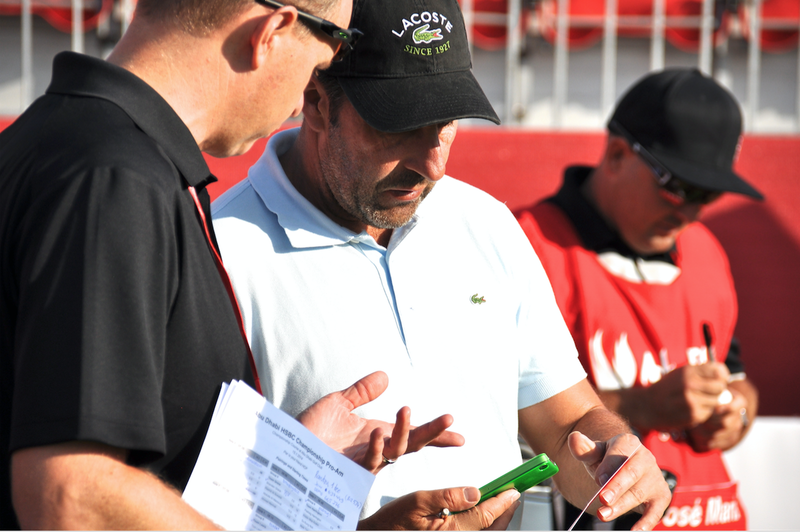 Mikko Rantanen teaching my idol Jose Maria Olazabal how to use GameBook. 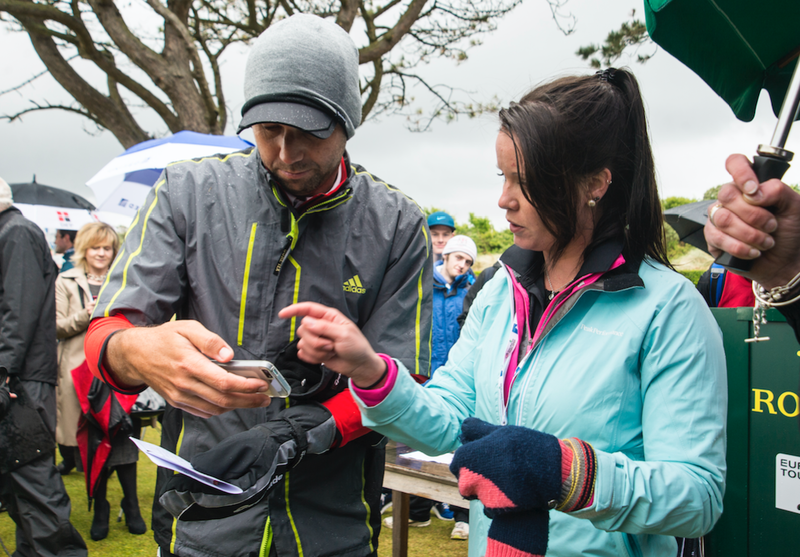 Our Emma Groop and Sergio Garcia defying the rain and getting acquainted with GameBook. Miguel Angel Jimenez getting ready for a selfie with Susanna Sarkki from the GameBook team. 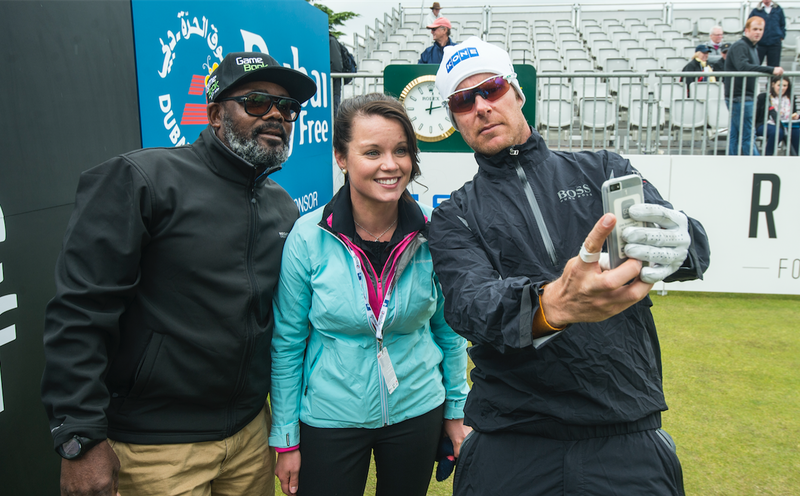 It’s selfie-time for Emma, Mikko Ilonen and his caddie Reggie. One more selfie, please! Here’s Susanna with this year’s Masters winner Danny Willett and his caddie. The only pro who has yet to lay his hands on GameBook is Darren Clarke who once told me on the first tee that even his mother can use the iPhone better than he can. I personally happen to think that his reluctance doesn’t have so much to do with lack of technology skills, but rather the fact that he still hasn’t been able to overcome the two times I played in his group on the final round of a European Tour tournament and beat him. I’m just kidding. Darren is a great guy and an excellent ambassador for golf and I hope he gets a chance to get more acquainted with modern technology one day when he is done with his playing career. We are rapidly approaching the end of this blog post series and the beginning of a whole new chapter in the history of Golf GameBook. Before you get a sneak peak to the new and improved GameBook, Mane will unveil how and why it has become the way it is today. I think this app is great if everyone is on the same golf course. What I would like to see is a way to stay connected with golf buddies around the world and play golf at our home courses. Then take those results and adjust for course rating, slope, and golfers handicap to create a virtual tourney. That would be something spectacular to see. Thanks for the suggestion! We’ll take this into consideration when putting together our roadmap for the future. Has the feature ‘Create Course’ been eliminated in the upgrade? If so that’s not good as course information Slope/Course Rating is often incomplete or inaccurate. We have a club of about 40 people and use Gamebook every week and out first day out with the new upgraded app there was no slope ratings for the ladies tees at the course we played and therefore the ladies handicap was not accurately reflected. In the past I’ve just gone and created a course with the appropriate information and it worked great. Happy to hear that you and your group have been using GameBook! You can still create new courses online by logging in at http://www.golfgamebook.com. But the best solution is to contact us at support@golfgamebook.com and let us know what is wrong. When we fix the data the correct info will be visible to all GameBook users.